A South Korean state research institute has developed a server technology that enables personal computers (PCs) to use voice, fingerprints and other biometrics as user identification tools. Using different kinds of biometrics to gain access to important data or user information has become a norm in the era of smartphones. Such identification methods rely on sensors fitted into smart devices, and many PC users still use a combination of passwords and encrypted keys to protect vital information and data. The Electronics and Telecommunications Research Institute (ETRI) said in a statement on Thursday that it has developed “FIDO2”, a new biometric identification technology for servers, which uses unique body features for quick and convenient access to information. FIDO2 is named after “FIDO”, an industry consortium launched to address the lack of interoperability. While the original version of FIDO technology is based on smart devices, FIDO 2 will be operated as a tool for web browsers and operating systems. ETRI competed with global tech companies such as Google and Microsoft at this year’s “FIDO2 Interoperability Testing Event” hosted by FIDO in August and passed a series of tests. 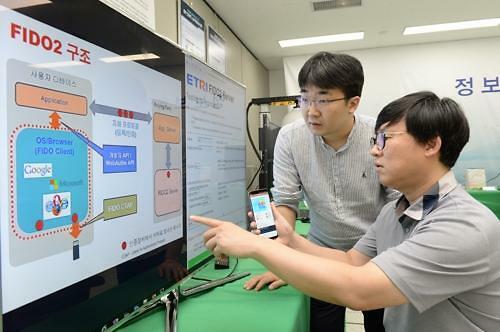 “We will finish the development of a Bluetooth Low Energy (BLE)-based facial identification device by the end of this year,” an ETRI official was quoted as saying. BLE, widely used in beacons and other stationary objects, receives user information and sends back requested data.